The Babe traded for this Tinkerbell Disney Pin that has [June] on it and must be part of a monthly series of pins, right? There's limited information that I can find on the pin. 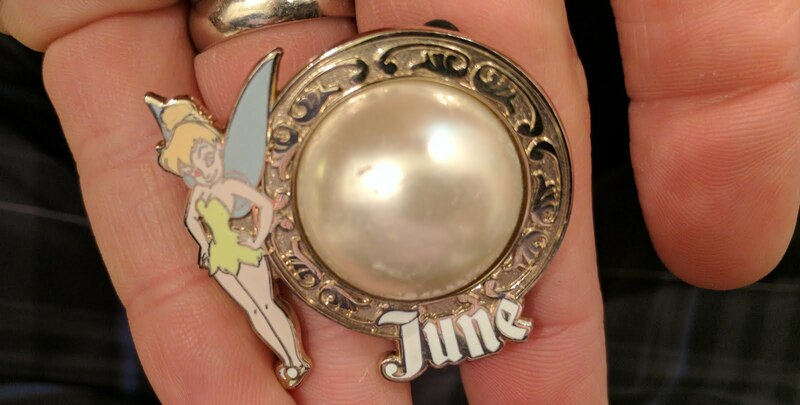 I've turned to my usual source of eBay and while there's other June birthstone-related Tinkerbell pins, this one just turns up some generic descriptions. PinPics isn't any more help as they don't have this one in their archives. This pin is interesting for the big pearl on it - and the dimension that it adds. The pearl is about 1/2" raised off the pin, so this is one of the larger pins that we've ever scored - and this one was traded for from the boat guys at the International Gateway outside the backdoor of Epcot. There are a few pins that we've traded for over the years that stand out in terms of being 'good finds'. This one ranks up there. Along with this vintage Polynesian Christmas one (that I don't seem to have posted) or this Minnie Mouse as Mary Poppins one.